is one of the closest organic farms to the Sydney CBD. We have been certified organic for over 20 years. Champion's Mountain Organics is an OGA certified biodynamic farm, owned and operated by Michael Champion .  The farm is located at Mangrove Mountain, almost half way between Newcastle and Sydney, and level with Gosford. In good traffic the drive into the city can be as short as an hour, which makes the farm ideal for supplying the city population with a wide variety of fresh and local produce. Michael is committed to supplying the highest quality produce available to suit modern tastes and cuisine. Our specialty are a range of new and unusual salad greens that are not widely cultivated. Our ambition is to supply produce that is inexpensive, tasty, and very healthy. While organic food is becoming more accessible, much of what is available is hard to find; expensive; of poor quality; or cultivated and supplied in a way that causes unnecessary harm to the environment (for example a high carbon footprint from importing interstate or international goods). It is impossible to to grow everything that is in season on one single organic farm, and any farmer who claims this is selling you a lie. In order to supply a robust range of produce, Michael represents many of the organic farmers in the Mangrove Mountain region to markets and organic stores and box suppliers. Everyone wins in this co-operative setup: Just one farmer makes the trips to market, saving on petrol and freeing up valuable time that can be spent growing more delicious food. The farms and farmers are all personally known to Michael and we can assure customers of the purity of the produce. We will supply the source of produce and whether it is bio-dynamic, organic or chemical free, so you can make a well informed choice. Certified bio-dynamic and organic produce makes up 90% of our range. Where a farm is not certified organic we can provide a statutory declaration from the farmer to prove the produce sold to us and to you is unsprayed and genuinely chemical free. We are seasonal - we are local - we are fresh. We can also run out, have gaps due to weather problems, due to demand or simply due to gaps that occur naturally. We can have gluts, so there should be specials available sometimes. We will try to be comparative in price, but remember to consider value as well as price - the modest price premium guarantees freshness and local produce, whether you live in Sydney, Newcastle or the Central Coast. All produce will fulfill the criteria of eating within the 100 mile, 160 km region. All his life Michael has had a green thumb. He comes from a gardening family going back as long as he can remember. "Growing vegetables, or any intensive crop, requires focus, dedication and commitment. Although I do it to make a living there are probably many other things I could do which would make more money (or make an equal amount as I do but with less effort!)." "I can't really say why except that it is always something that I have wanted to do. I always grew something wherever I lived whether it was digging through the detritus in a back yard in Newtown in the 70s or growing herbs in the only light available on a window sill in a London flat. When Nancy and I moved house it was always to have more space to grow until the ultimate decision was made 20 years ago to return to Australia to buy a farm." "Again, the joy of growing, of preparing and nurturing the soil and planting neat rows and watching your work mature. Some of the satisfaction is gained from the monetary returns (people are still surprised that it all works) and also the satisfaction of having many loyal customers (both direct and indirect) who actively seek out my produce and are prepared to buy my lines in preference to other growers."